This report is part of “Breathing Fire,” a series of research reports and journalism features by Climate Central. In more than half of the states in the American West, the largest wildfire on record for each state has occurred since 2000. Large wildfires damage landscapes, property, infrastructure, and local economies. They can claim lives directly, and cause or exacerbate serious health problems by releasing significant quantities of air pollutants, including the fine particles known as PM2.5 (particulate matter smaller than 2.5 microns in diameter). 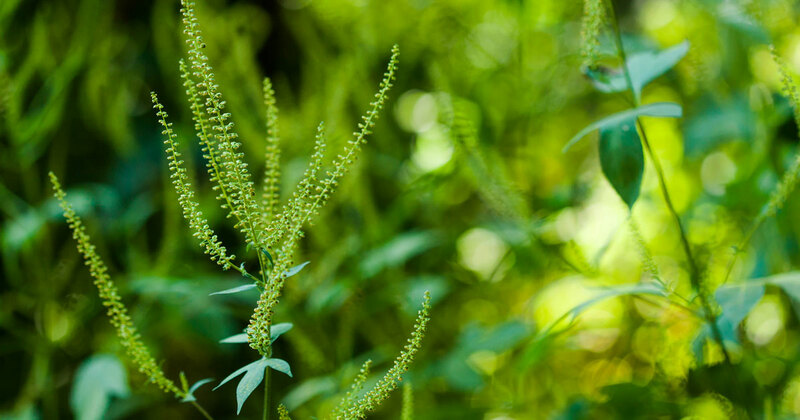 These harmful effects extend well beyond where the fire itself burns. Though climate change is not the sole factor increasing the size and frequency of western wildfires, it is an important contributor. Climate Central previously analyzed trends in PM2.5 concentrations for California’s Central Valley between 2000 and 2016. This report updates that analysis and extends it to three additional states — Idaho, Oregon, and Washington — all of which are also plagued by worsening wildfires in a warming world. In 2017, Climate Central analyzed trends in annual PM2.5 concentrations between 2000 and 2016 for the Sacramento Valley and the San Joaquin Valley, which together comprise California’s Central Valley. 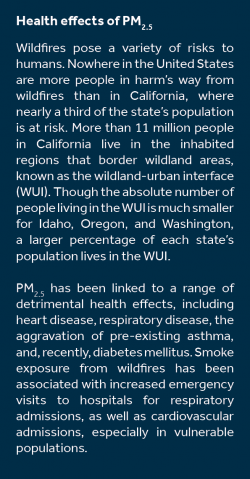 PM2.5 was chosen because of its association with wildfires and detrimental health impacts (see sidebar). The U.S. Environmental Protection Agency has established a federal 24-hour PM2.5 standard of 35 micrograms per cubic meter (µg/m3). In both the Sacramento and San Joaquin Valleys, the number of days for which PM2.5 concentrations exceeded that standard declined between 2000 and 2016, likely related to efforts to curb emissions from industrial sources. However, the percent (as well as the absolute number) of exceedances each year occurring during California’s wildfire season (June to September) was found to be increasing. This trend is especially notable given that atmospheric conditions and certain residential activities may contribute to more PM2.5 exceedances in the winter. During the winter, wood-burning for heating by individuals becomes a primary source of PM2.5 along with continued contributions from industry, transportation and other sources. The previous analysis covered 2000 to 2016 since those years had adequate data for analysis (i.e. data on PM2.5 levels were available for at least 95 percent of the days in that year). The analysis has been updated to include calendar year 2017 and three new states, again using the same data criterion. Previously, exceedances were counted if they were literally highlighted as exceedances on the California Air Resources Board website; for unknown reasons, the website does not highlight concentrations between 35.0 and 35.4µg/m3. Because only raw data were retrieved for Idaho, Oregon, and Washington and exceedances were not pre-highlighted, all days with concentrations above 35.0µg/m3, as established by the federal standards were counted as exceedance days, and California was adjusted to match. 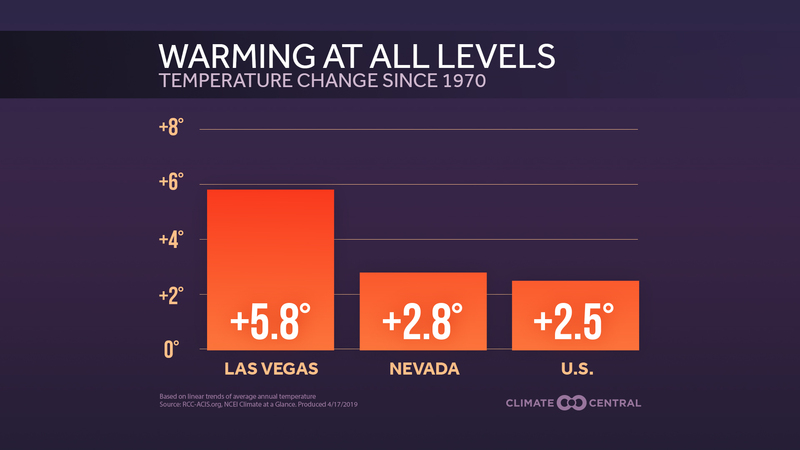 This change did not affect the trends previously reported for California, and data from 2017 continue the trend previously observed for 2010-2016 for regions of California. 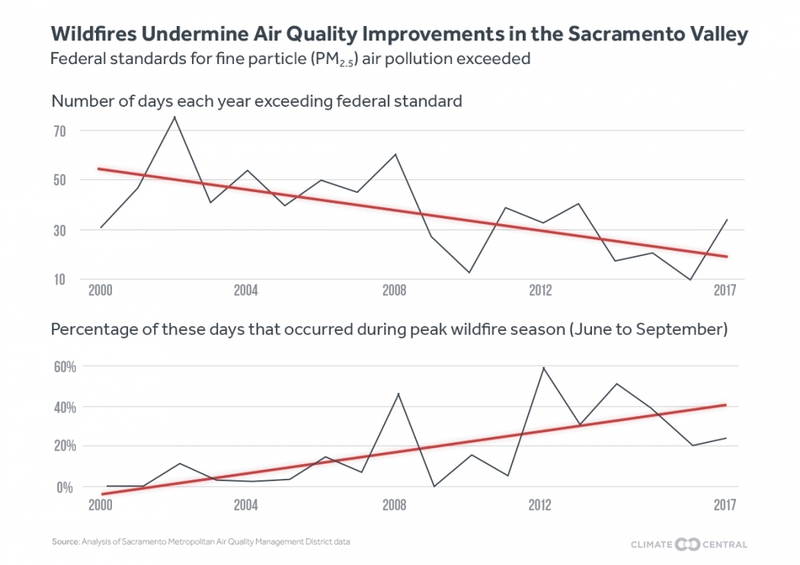 Overall, air quality in the Central Valley is still improving, with the number of days per year with 24-hour PM2.5 exceedances falling in the Sacramento and San Joaquin Valleys. The Sacramento Valley averaged approximately 47 exceedances per year prior to 2010 and only 26 per year since that time. The San Joaquin Valley has more total exceedances than the Sacramento Valley, with approximately 90 in the earlier period 60 more recently. However, the percent of exceedances occurring during wildfire season is still increasing. Prior to 2010, only about 10 percent of exceedances would occur during the wildfire season in the Sacramento Valley. During some recent years the Sacramento Valley is seeing more than 50 percent of its exceedances occurring during this season. For the San Joaquin Valley, the percent of exceedances has gone from near 5 percent to often being near 15 percent. 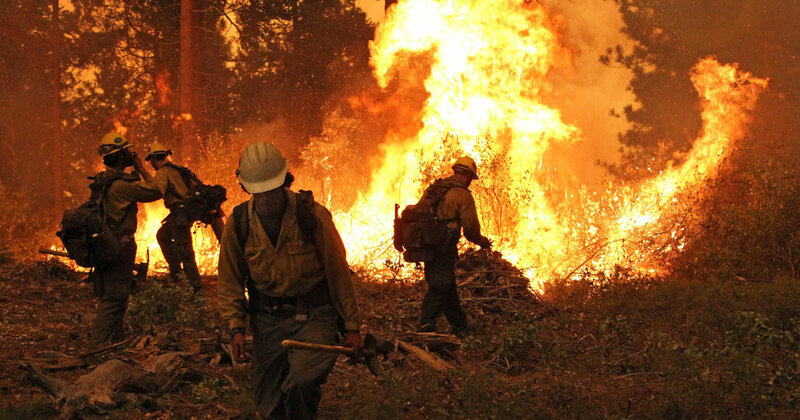 In Idaho, Oregon, and Washington, “wildfire season,” has historically been regarded as lasting from July to September (by contrast to California’s June-to-September season). Across the West, wildfire season is now 105 days longer on average when compared with the 1970s. Essentially, in recent years, the peak wildfire season is no longer confined to the months that it was when these assumptions were originally made almost 50 years ago. Idaho has experienced more than 10 times as many large fires (larger than 1000 acres) in a typical year since the 1970s, Oregon nearly seven times as many, and Washington nearly five times as many. 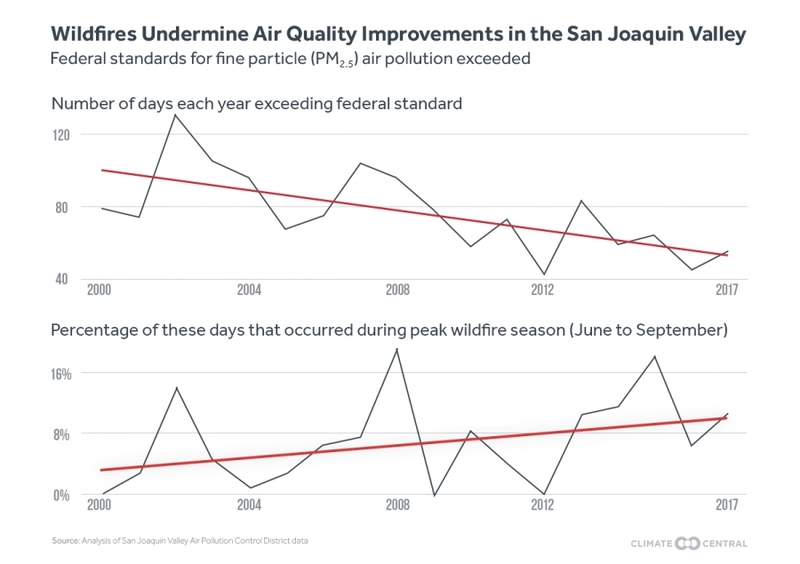 To mirror the analysis for California’s Central Valley, total annual PM2.5 exceedances of the daily federal standard for PM2.5 were compared with the number of exceedances during the July-to-September wildfire season for each state. A year was included only if PM2.5 data were available for at least 95 percent of the days during the year. In Idaho, our analysis covered 1999 to 2017. During that time, the overall air quality (based on PM2.5 exceedances) improved only about 3 percent with approximately 40 exceedances per each year in the period. In Oregon, total PM2.5 exceedances have fallen by about 37 percent between 2000 and 2016, the time frame for which adequate data were available, although four of the last six years analyzed had 46 exceedances each. More of these 46, however, are occurring in wildfire season, and in general, the percent of exceedances in Oregon occurring in the wildfire season is going up. In Washington, data was only available for an 11-year period (2007-2017), which means that it is hard to draw significant conclusions. However, Washington saw the number of overall exceedances increase from on average only about three per year from 2007-2010, to over 37 since 2010. A clear trend during wildfire season has not yet emerged. Wildfire smoke can travel great distances, as satellite images demonstrate. 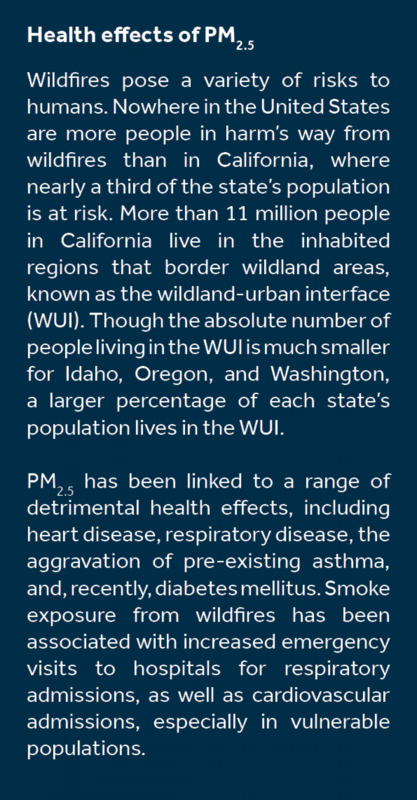 Thus, the correlation between wildfire location and PM2.5 concentrations is not always exact; this is one reason the analyses for Idaho, Oregon, and Washington were done for the whole state and not broken down into more specific geographic regions as was done for the Central Valley. Jaffe et al. (2008) found that across Washington and Oregon, and across all of Idaho, PM2.5 concentrations were correlated to each other, further supporting this approach. Climate models predict that by the end of the 21st century, the Pacific Northwest will see average summer temperatures between 4.7 and 6.5 degrees Fahrenheit higher than they were in the second half of the 20th century. Warmer weather, coinciding with less rain and the drying out of forests during the summer, are both major factors in increasing the extent of wildfires and are both linked to human-caused climate change. One study found human-caused climate change accounted for about half of the increase in fuel aridity (the measure of how dry and flammable a landscape is) across western U.S. forests between 1979 and 2015, and contributed to an additional 4.2 million hectares of burned area between 1984 and 2015. One measure of fuel aridity is the Keetch-Byram Drought Index (KBDI), a metric previously analyzed by Climate Central for the western United States. KBDI measures the dryness of the top 8 inches of the forest floor and assigns a number from 0 to 800, with higher numbers representing more dryness and an increased potential for wildfire activity; days with KBDI above 600 indicate that the potential for wildfires is high. Of the western states analyzed, California will experience an additional 24 high wildfire potential days based on KBDI by 2050, Idaho will experience 15, Oregon 17, and Washington 18. In addition to these direct impacts, climate change is also indirectly affecting wildfire potential by negatively impacting tree health and mortality, which could increase the fuel available to fires. Dead fuel is often what initially ignites a wildfire, therefore more dead fuel leads to more fires. Climate change could also bring more rain to the West at times, which would increase the biomass of forests. Then, when another dry period occurs, wildfires might ignite more easily and burn more severely than they would have otherwise. Wildfires not only emit PM2.5, but other pollutants as well, including greenhouse gases. In 2015, greenhouse gas emissions in Oregon and Washington from wildfires were equivalent to the annual emissions from more than 8.5 million passenger vehicles or heating 3.7 million homes for a year. In a damaging feedback loop, these greenhouse gas emissions contribute to climate change, leading to more conditions ripe for sparking wildfires, which then emit more greenhouse gases into the atmosphere, causing further warming. Forces outside of human-caused climate change may also affect the variability of wildfire seasons in the decades to come. In addition to natural climatic variation and ecological changes, previous efforts to suppress wildfire activity (which led to an accumulation of combustible undergrowth and deadwood), overgrazing, logging, and land-use conversion all could contribute to increased severity and frequency of fires. These practices have led to fire deficits, more fuel accumulating in fire prone areas, and enable large and severe fires. Methodology: Air quality data for California were acquired from the California Air Resources Board’s Query tool site selecting for PM2.5, daily average, and year-at-a-glance values. Air quality data for Idaho was acquired from the U.S. Environmental Protection Agency’s website for PM2.5 each year and then aggregated. Air quality data for Oregon was acquired from contacts at Oregon Department of Environmental Quality. Air quality data for Washington was acquired from Washington’s Department of Environmental Quality website. Using the “Group Report” option, data were downloaded for Central WA, Eastern WA, and Western WA after selecting periodic 24-hour averages, and then aggregated. All data were downloaded as a CSV file and Excel was used to tally annual exceedances, exceedances during wildfire season (June, July, August, and September for California; July, August, and September for Idaho, Oregon, and Washington), and to find the ratio of these two values for all years for which at least 95 percent of data was available. Some reporting stations report with less frequency than other stations. Linear regression fits were calculated using the R statistical software package for the Sacramento Valley, the San Joaquin Valley, Idaho, Oregon, and Washington. We gratefully acknowledge John Abatzoglou (University of Idaho) and Dr. Alyson Kenward for reviewing the analysis and providing helpful feedback on an earlier version of this report.